Summer hiking: beat the heat - GetGoing NC! Shuckstack/Lost Cove/Lakeshore Loop, Great Smoky Mountains National Park, 11.6 miles (Trip No. 21 “Backpacking North Carolina”). Harper Creek/North Harper Creek Loop, 13.6-mile loop, less for an out-and-back Wilson Creek Area, (Trip No. 9, “Backpacking North Carolina”). Huntfish Falls, 16.4 miles with shorter options, Wilson Creek Area (Trip No. 8, Backpacking North Carolina”). Clingmans Dome, 26.2 miles, Great Smoky Mountains National Park (Trip No. 19, “Backpacking North Carolina”). 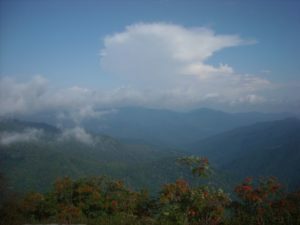 Shining Rock Wilderness, various lengths (Trips 14, 15 and 16, “Backpacking North Carolina”). Mountains-to-Sea Trail through Graveyard Fields, 3.2 miles, Blue Ridge Parkway (Milepost 418.8) (Hike No. 62, “100 Classic Hikes in North Carolina”). Basin Cove, Doughton Park, various from 8.5 to 20+ miles, Blue Ridge Parkway (Trip No. 11, “Backpacking North Carolina”). Pink Beds, 5 miles, Pisgah National Forest near Brevard (Hike No. 80, “100 Classic Hikes in North Carolina”). Mount Mitchell, various lengths & options, Black Mountains (Trips 1, 2, 3, “Backpacking North Carolina”). Learn more about those hikes, here. Earlier this week, our sister site, NCHikes.com, posted its recommendations for five hikes especially well suited for August. There’s one at the coast (Lake Waccamaw), two in the Piedmont (Pilot Mountain and Johnston Mill Nature Preserve) and two in the mountains (Wilson Creek and Price Lake). So what if it’s hot, sweaty summer! Go for a hike! Previous PostGetExploring! Greenville: discover down eastNext PostThis weekend: GetExploring! GetVollying! GetCraggy!